We’ve only just arrived in our latest home away from home, but already we’ve taken to the city’s famed riva promenade which is now lined with blue and white Christmas market huts. For someone who grew up in the American Midwest, it’s odd yet utterly fantastic to see Christmas decorations and palm trees mingling. In between apartment hunting and getting our bearings, we’ve also briefly explored Split’s delightful fresh produce and fish markets, which overflow with goodness every day. We’ll report more soon from this city that’s replete with Roman grandeur and Dalmatian charm. 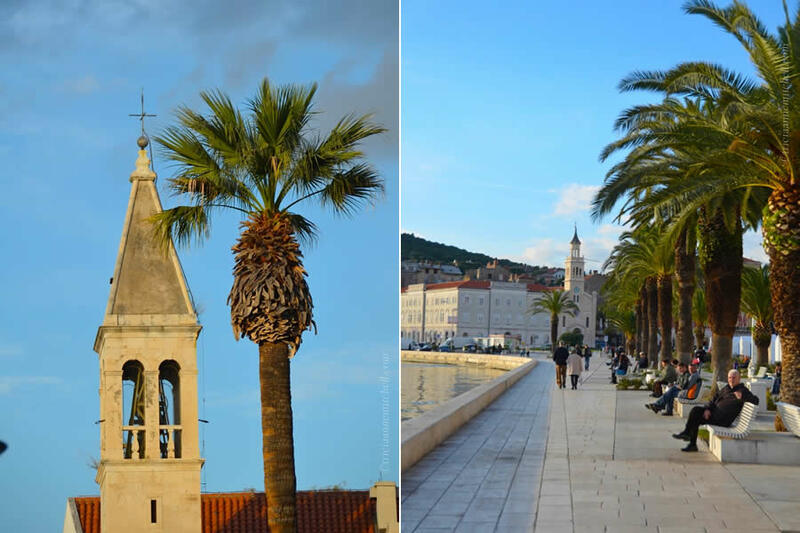 One of many palm trees lining Split’s riva, a sophisticated seaside promenade. 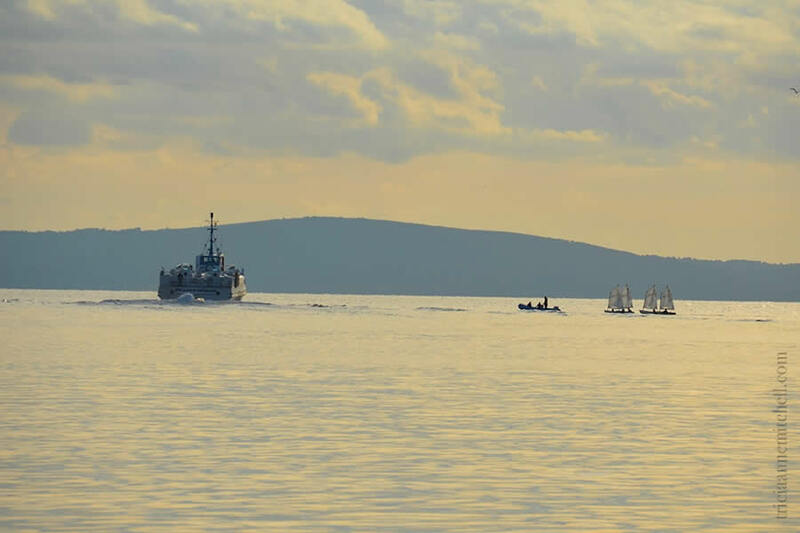 During a brief time sitting along the Adriatic Sea, we spotted ferries and students taking sailing lessons. 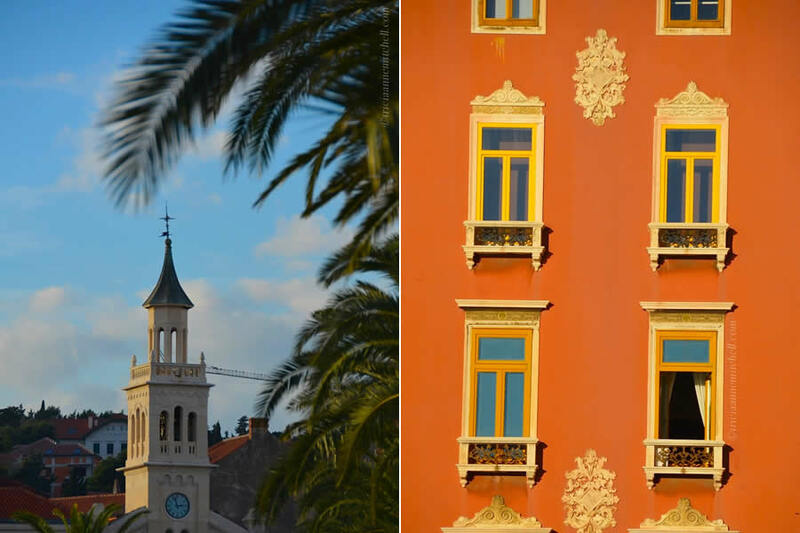 Views along the riva: palm trees, a bell-tower, and locals taking in the views of the Adriatic. The 12th century tower of the St. Duje Cathedral anchors Split’s old town skyline. 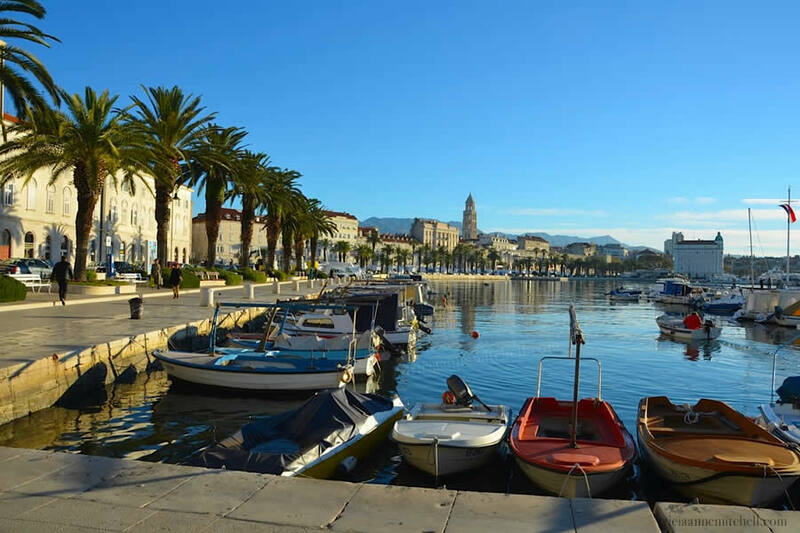 If you’ll be staying in Split for three days or more, be sure to pick up a free Split Card, which gives you free entry to certain museums and galleries, and reduced rates to others. If you’ll be in Split for less than three days you can purchase the card for 5 Euro. During our 2+ months spent in Split, we stayed at the lovely Kaleta Apartments (affiliate link), which are located within Diocletian’s Palace. Our studio apartment (called the Diocletian’s Suite) featured much character, including Roman brickwork, and views of Old Town Split below. Owners Novica and Negri were thoughtful citizen ambassadors too. 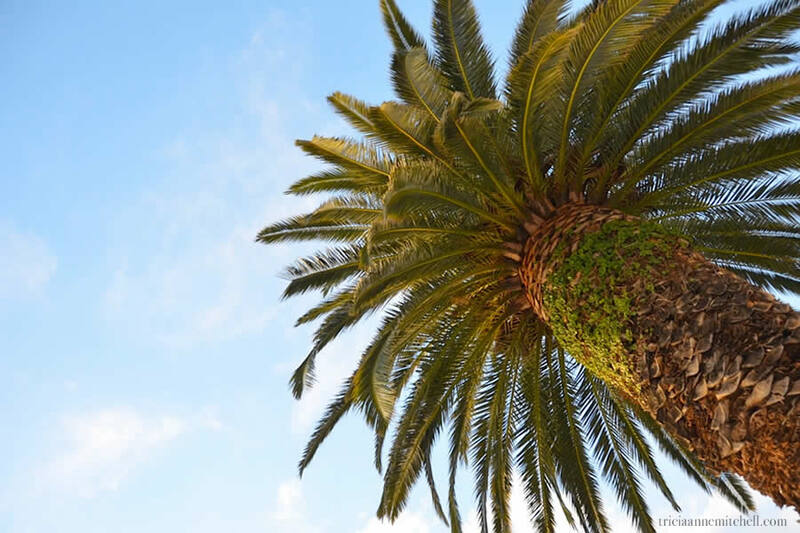 We wholeheartedly agree, Magdalena – that’s why we’re spending our second winter here. Siena is also a spot we’d like to explore someday soon. Your site looks as though it’s a comprehensive resource – thanks for connecting! Terri, we’re lucky to be here. Did you and James visit Split around the time when you roosted in Dubrovnik? :) This city brings out the kid in you with all its nooks and crannies. Love it! Tricia, we never made it to Split, so I can’t wait to see it through your eyes. Wow you made an excellent choice, really looks wonderful there! Phil, Split is indeed a special place to hang our hats for the winter – so much history and natural beauty. :) Knowing that you’re someone that appreciates wildlife and photographing it, you’d probably be interested to hear that Croatia’s said to have a lot of different bird species, many of which are considered endangered in Europe. Looks like a wonderful place to spend time. I love all the history. Look forward to more pictures. Cornelia, the Christmas market scenes will definitely look quite different from those in Bavaria, won’t they? Snow-kissed mountains traded for palm trees. :) I am happy that we were able to attend at least one Weihnachtsmarkt in O-gau before leaving. It’s such a perfect snow globe village. I’ve heard that the promenade’s look has changed in recent years; it would be interesting to see what it looked like originally. Were you here during travels with your family or as an adult? I was a child of probably eight years than. My parents took us for affordable summer vacations many times to Yugoslavia than. To some of the islands, Raab, I remember, where my oldest brother was bit by a shark, it was a minor injury, but for as kids it was so exciting, not for my parents though. Oh no! It’s funny how events are interpreted so differently by children; so lucky your brother wasn’t severely injured. Lucky you, it look very nice. We have to “pinch ourselves” everyday to believe we’re really here, Mark! :) Where will you be for the holidays? I’m off to Israel and then Cyprus on the 20th, It’s work but I’m going with my brother and nephew. It’s nice you’ll be in a pretty warm spot for the holidays. What part of Cyprus are you planning on visiting? I was there several years ago. Loved exploring the Troodos Mountains and Paphos, along with a day trip into the northern part of the island. We will arrive in Limassol, and depending on how much time we have on shore, it could be anywhere! Wish you safe travels and an enjoyable time there. Cyprus is a beautiful island! Glad you enjoyed it, Dad, and happy to have rescued Mom with her technology challenge. :) Look forward to seeing you. Wonderful that you get to go during the off-season – must be such different feel! Did you have the chance to go up the bell tower? How was the view? Neely, we’ve haven’t braved the St. Duje bell tower yet, but it’s piqued my curiosity. I must confess that I have a fear of heights and have been frightened by Dalmatian bell-towers ascents before, though. What was it like here during your visit – quite busy and warm? Yes, it was quite warm and the streets were filled with people — most likely tourists :)…I could see why you’d be frightened by those bell towers — they seem very narrow and confining. Annette, after spending a few weeks in snowy Germany, the palm trees juxtaposed with Christmas decorations are even more welcomed! 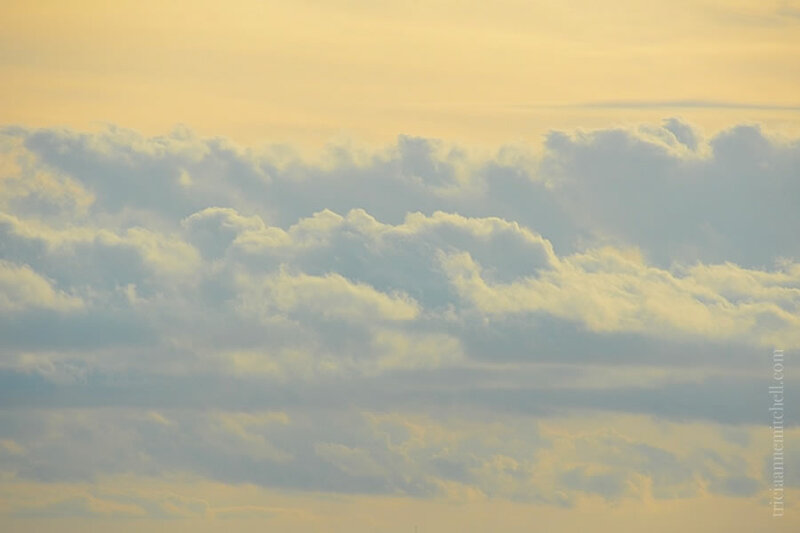 Just yesterday, we were surprised to see a woman swimming in the Adriatic. I’m sure the water was chilly as ever, nevertheless it was an unusual December scene. What a great choice for a winter respite. It has a mixture of all those things you like. History, charm, friendly people, markets, etc. I look forward to your photos and stories. I always learn something, Tricia. Lynne, that’s a great compliment to hear that you take away some tidbits from my posts; thank you. Will you and Ron be spending the holidays in FL? Love Croatia! What a great winter escape. Ruth, it’s an especially wonderful escape this year, at least according to the locals. They keep saying that this a milder winter than usual. We feel spoiled and quite lucky, but would love to return in the summer one of these days so that we could go out into the water. I really enjoy all your photos and information about Croatia (and other destinations!) The moon-lit sphinx head taken through the palace wall is fantastic. Every person I have ever talked to who has visited Croatia has nothing but good to say about it. Enjoy your winter! Marilyn, I’m flattered by your kind words; thank you. Christmas decorations and palm trees — that’s my kind of Christmas. Dorothy, I quickly discovered that it’s my kind of Christmas too. :) Belated happy new year greetings to you! How much time did you spend on Madeira?